Written by owl and bear staff on Tuesday, October 16th, 2012 at 9:00am. Florence Welch‘s shows are always like Sunday morning mass, with each song equivalent to a sermon from her own personal bible. That said, Florence and the Machine’s show in Chula Vista on October 4 was a little lackluster. The spectacle was amazing as always — from the art deco stage design to the large LCD video screen — but it couldn’t make up for an experience that felt generic compared to Florence’s past performances. The two misplaced opening bands, The Maccabees and The Weeknd, added to an overall feeling of confusion. There was a surprising fan base for The Weeknd, which is comparable to dubstep R&B (not any less strange-sounding on paper). 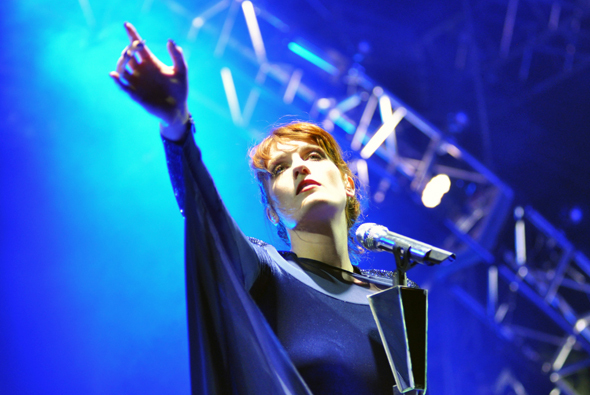 On the decidedly autumnal evening, there was a palpable chill in the air as Florence Welch and her band took the stage with an intense version of “Only if for a Night,” from her sophomore record, Ceremonials. “What the Water Gave Me” followed, with Florence gallivanting around just as over-emotionally as on the first song. After the next couple of songs, including the transcendental “Cosmic Love” (from her debut album, Lungs), one thing became clear: each song was dragged out just for the live show, whether it deserved to be or not. The extension of songs — including guitar, key, and drum solos — is expected and usually appreciated during live shows, but it’s indulgent when it happens with every song. That became the trend for the rest of the set. It was most enjoyable during Florence’s signature anthems like “Rabbit Heart (Raise It Up)” and “Shake It Out,” but most jam sessions yielded more of a sigh than an exuberant “Amen!” from the half full venue. Concert sins and low attendance aside (apparently the Black Keys had won the battle for the night in San Diego), the show wasn’t half bad. Florence touched on all the popular hits and even made time for some chatter, which included a nod to the lovely zoo and also the Casbah (where she had checked out Blood Red Shoes the previous night). Hopefully next time, the Florence congregation will feel a little more in touch with their preacher.